Interested in working at Mew Haven? We do not have any positions open at the moment, but if you would like, you can submit your information for future consideration. Please read the job descriptions on this page before filling out the application. The Cat Lounge Attendant is in charge of the cat room. You love talking about cats and you love the cats you talk about! Must love cats - You recognize each cat and its individual personalities, likes, and dislikes. 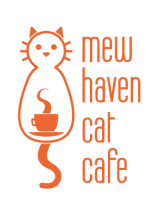 The Front Desk / Barista is the face of Mew Haven. You're the first person they see and you're a fount of information. Please note this position is exclusively in the café side -- You will not be handling or interacting with cats while you are working a café shift. Great communication skills - Since you'll be the first person customers see, you'll guide many guests through their first visit to a cat café.